For the first time, the commemorative Seattle Beer Week beer is a style that does not concentrate on hops. While I am a self-proclaimed hophead, I welcome the change. Coffee stouts/porters are one of my favorite styles when done well. 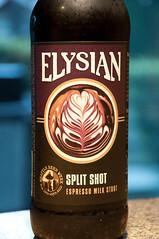 Elysian used cold-infused coffee from Lighthouse Roasters in Fremont for this brew. Pours a very dark brown with a creamy light brown head. Coffee comes through loud and clear in the aroma along with some chocolate. The coffee continues in the flavor, and the profile manages to come through as smooth espresso with very little bitterness or unpleasant flavors. Dark roasted malts lay the base and lend flavors of chocolate that builds towards the finish. But, coffee comes through more than anything else. There is just a hint of sweetness, and the medium body holds up the flavors just fine. Overall, I really enjoy this year’s commemorative beer. I’m a big fan of coffee beers, and I’d put this in the upper echelon of what I’ve tried. It packs in quite a bit of flavor while ultimately remaining quite sessionable. I think the body is just about right, and I’ll be happy to throw down several of these throughout Seattle Beer Week. Well done by the crew at Elysian. Look for this in 22oz bottles and on draft all over town. Agree, enjoyed this one. A beer for black coffee drinkers. What’s up with the ABV? My bottle says 5.6. That is a GREAT one. I am not a coffee fan, but man it was good.